Allergy Protector made with pristine. This fabric is soft, comfortable, washable in hot water, and noise free. It provides true protection against allergens and dust mites, while allowing full “breath-ability”. 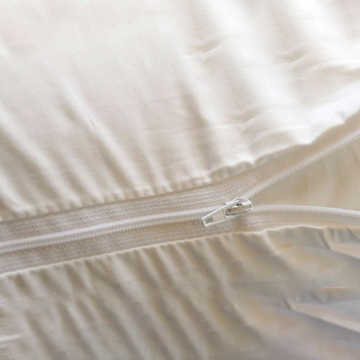 In addition, pristine is treated with AEGIS Microbe Shield, to inhibit the growth of microorganisms, as well as control of mold, mildew, and odors on the surface of the fabric. Now you can enjoy a quality Down Pillow even if you had allergy problems in the past. All sizes of our zippered pillow protectors are now also available in Pristine which is made of very tightly woven yarns, providing a true physical barrier (9 microns) against allergens and dust mites, yet allowing air to flow freely. This fabric is soft, comfortable, washable in hot water, and noise free“. 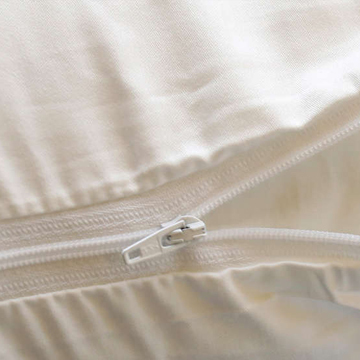 In addition, pristine is treated with AEGIS Microbe Shield, to inhibit the growth of microorganisms, as well as control of mold, mildew, and odors on the surface of the fabric.